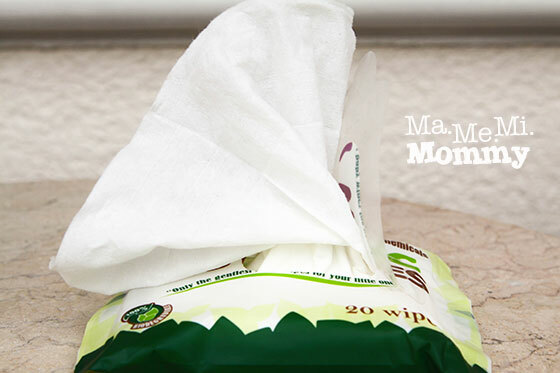 The right baby wipes, that is! Actually, I’m not very particular with the kind of baby wipes that I use on the kids. They’re all the same, I figured. That is, until DA got a big red mark beside his lips one day. When I asked him about it, he said that he was trying to remove the chocolate marks on the side of his mouth and so he rubbed it with the sheet of wipes. Imagine that! Aren’t baby wipes supposed to be baby-skin-friendly? Meaning non-irritating? Non-ouchie? DA had to sport the scar for a good few days, which made him look like a vampire after a kill. Ugh! So anyway, I’ve known better since. Which makes me so glad to have found Organic Baby Wipes. Now these are what baby wipes should be! Those are all that you need to know about it. Oh, and it’s also 100% biodegradable! Plus, that each sheet is smooth and thick (see how one sheet seems opaque already in the photo below)! I always feel sayang to throw it away after just one use so I try to wipe other things also, just to maximise its use. LOL! I’ve road tested it many times during our recent summer trips and have used it to wipe faces, hands, bums, even the entire body! I am so happy to report that DA hasn’t had any irritations with it, no matter how much he rubbed it on his skin! These wipes come in 2 sizes, the extra large one at 30pcs and the smaller, more handy one at 20 wipes. I use another brand of wipes. I will surely check this one out as I love anything organic. Thanks for sharing mommy! I’ve been looking for one too! Welcome! 🙂 I bet you’ll love it too. 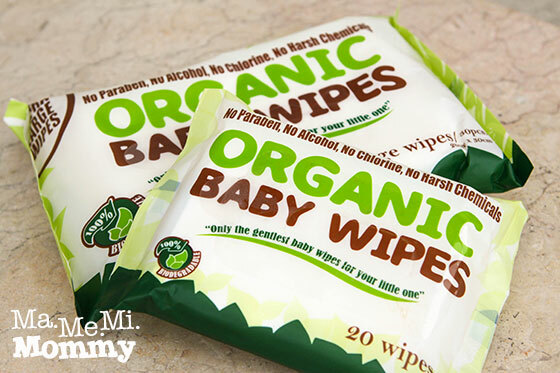 I also love Organic Wipes! I love how nice it smells. We’ve been using wipes less and less in the house since my son is already 3, but I still have a regular supply of them at hand. I love that this brand is biodegradable! I love it!!! Ang bango and ang tibay ng sheets no? Ako din nanghihinayang sa piece eh. So I would usually wipe something else. hihihi! hahaha! I can feel you! Nakakahinayang talaga lalo na kung amoy aloe vera yung wipes… Baby wipes are so precious pa naman pag may baby… Can’t go without it! I’ve also tried this brand of baby wipes, and I like it a lot! It’s safe to use and smells really nice! Where is it made po? Is there a certification that it is really 100% organic? Saw on Amazon about some organic products that contain certifications. Hi Sheila, it’s distributed by CKMJ Greenovation Inc. It does have a certification of organic ingredients.